Recently, the Massachusetts Department of Transportation (MassDOT) announced that the toll collection lanes marked “ALL VEHICLES” on the Tobin Bridge will now be “CASH ONLY” and “E-ZPASS ONLY” lanes. The change took place on the 21st of October at 10:00 p.m.
With this change, E-ZPASS drivers will now be able to drive through the toll unimpeded as customers who use cash will have to go through the “CASH ONLY” lanes. Close to 65 percent of drivers who pass through this toll plaza rely on their transponders to pay their toll. “Tobin commuters will now know what to expect from the drivers in front of them. Predictability will improve safety,” said Frank DePaola, Highway Administrator with MassDOT. Our Boston car accident attorneys understand that the change is also going to bring about increased operational flexibility. With the lanes that are marked as “CASH ONLY” and “E-ZPASS ONLY,” transportation officials will now be able to accommodate our congested traffic flow, deal with emergencies better and will be able to make construction zones safer. Currently the Tobin Bridge project is underway in the area — at a cost of close to S45 million. This change in the toll plaza is part of a more than $1 million project to transition to the E-ZPASS toll collection from the FastLane collection. This transition will eventually occur throughout Massachusetts. The signs and the road markings in the area have already been replaced to help to direct drivers. This has taken place from West Stockbridge to Boston. The truth of the matter is that we have to pay for our roadways. Motorist safety heavily relies on the funds that are available to make our streets smooth, functional and safe. Needless to say, it doesn’t look like toll booths are going anywhere any time soon. It’s important for drivers to be on their best behavior behind the wheel in these areas to help to not only fund safer roadways, but to reduce the risks of accidents in the now. 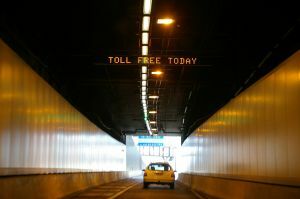 -Make sure that your toll money is ready before entering the toll plaza. -Reduce your speed to a maximum of 35 miles per hour. -Clear your toll transaction with the toll collector before proceeding through. -Stay alert for other drivers who might make last minute decisions in these areas. -Be on the lookout for large vehicle. The lane for these kinds of vehicles is usually located closest to plaza buildings. -When approaching a toll booth and meeting the toll collector, come to a complete stop. -If you have an E-Z Pass, make sure you pass through the toll traveling at 5 miles per hour. -Make sure you’re in the correct lane. Get into your designated lane as soon as possible. Don’t wait until the last minute. -Once through the toll, look before changing lanes. Vehicles are merging into the same lanes in these areas. If you or someone you love has been involved in an accident, contact the Law Offices of Jeffrey S. Glassman for a free and confidential consultation to discuss your case. Call 1-877-617-5333 today!